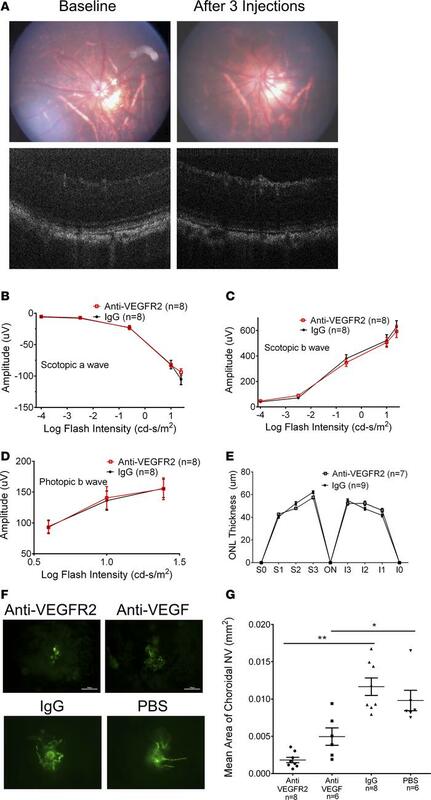 Inhibition of VEGFR2 suppresses choroidal neovascularization (NV) without photoreceptor damage. Brown Norway rats had fundus photography (A, top left) and optical coherence tomography (A, bottom left) through the posterior pole at baseline and then were given 3 intravitreous injections a week apart of 40 μg of a neutralizing antibody directed against VEGFR2 in one eye and control IgG in the fellow eye. One week after the third injection, repeat fundus photography (A, top right) and optical coherence tomography (A, bottom right) showed no change in appearance or thickness of the retina. Electroretinography showed that compared with control IgG-injected eyes, those injected with anti-VEGFR2 had no significant differences in mean scotopic a-wave amplitudes (B), mean scotopic b-wave amplitudes (C), or mean photopic b-wave amplitudes (D) at any of several flash intensities tested. Rats were euthanized and outer nuclear layer (ONL) thickness was measured at 6 locations in the 12:00 to 6:00 meridian passing through the optic nerve. There were no significant differences in mean ONL thickness at any of the 6 locations in anti-VEGFR2–injected eyes versus those injected with control IgG (E). Brown Norway rats had laser-induced rupture of Bruch’s membrane at 4 locations in one eye followed by an intraocular injection of 20 μg anti-VEGFR2 (n = 8), 20 μg of control IgG (n = 8), 40 μg of aflibercept (anti-VEGF, n = 6), or PBS (n = 6). After 14 days, rats were euthanized and choroidal flat-mounts were stained with FITC-labeled Griffonia simplicifolia agglutinin lectin. Representative images show small areas of choroidal NV in eyes that had been injected with anti-VEGFR2 or aflibercept (anti-VEGF) and large areas of choroidal NV in eyes that had been injected with control IgG or PBS (F). Image analysis showed that compared with eyes injected with control IgG, those injected with anti-VEGFR2 had a significant reduction in the mean (±SEM) area of choroidal NV, and compared with eyes injected with PBS, those injected with aflibercept (anti-VEGF) had a significant reduction in the mean (±SEM) area of choroidal NV (G). *P < 0.05, **P < 0.0001 by ANOVA with Bonferroni’s correction for multiple comparisons.